The collaboration between Ohio State University and the Ohio Third Frontier will leverage new knowledge and research to create a pipeline of innovative and compelling solutions for those with neurological disorders. The $21 million in research funding will establish Ohio State University as a global leader in neuroscience technology development, and will help the State of Ohio create more high-tech jobs and companies. The Neurotechnology Innovations Translator, which will be based in Columbus, will identify and move technologies rapidly from concept to clinic, supporting new company formations to bring neurotechnologies to the marketplace. This month Ohio State University also received an additional $1 million gift from the Ross Family to further advance nursing programs in the Richard M. Ross Heart Hospital, which is one of three Ohio State University’s hospitals. This gift is among the largest single gifts to nursing care in the country. The Ross family has donated approximately $13 million to various areas of Ohio State University. Ohio State University is a richly funded research market for life sciences. The university has been ranked 3rd among all American universities for private industry sponsored research, and it spends at least $600 million in research each year. In 2013 Ohio State University has received more than $131 million in research funding from the National Institutes of Health and more than $66 million as of June 2014. With a significant number of research programs ongoing, researchers at Ohio State University are seeking the best tools and equipment to help develop research progress and spare valuable research time. Laboratory supply companies cannot afford to miss the opportunity to network with academic researchers at Ohio State University. 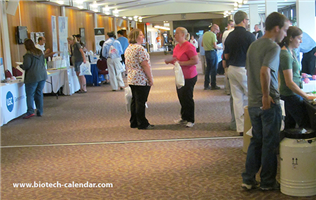 If you are a lab supply company and would like to demonstrate your products and services to Ohio researchers, Biotechnology Calendar, Inc. invites you to the 15th Annual BioResearch Product Faire™ Event at Ohio State University on August 7th 2014. 107 were purchasing agents, professors and post docs. These attendees came from 35 different research buildings and 50 on-campus departments. Biotechnology Calendar, Inc. is organizing more than 60 on-campus tradeshows at different institutions across the country, please read the Show Schedule for 2014.